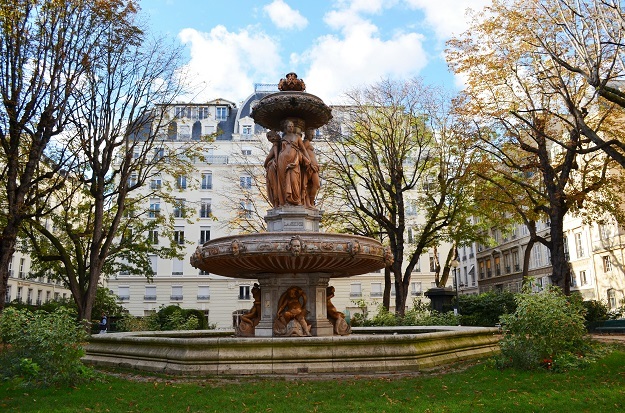 Strolling along the side streets of Paris daily, I was often visually overwhelmed by the intricate parks I would pass. The spaces would be tiny but the details exquisite; each park is symmetrical, the greenery and flowers are orderly and there will always be a fountain or statue to marvel over. The little park above was one of many favorites that I stumbled on randomly and probably couldn’t find again, but the burst of pleasure I felt when I came upon this space will stay with me forever. Walking along and finding a tiny spot of silence and sanctuary hidden amidst a city’s hustle and bustle is one of my favorite parts of travel.